'Surreal'? 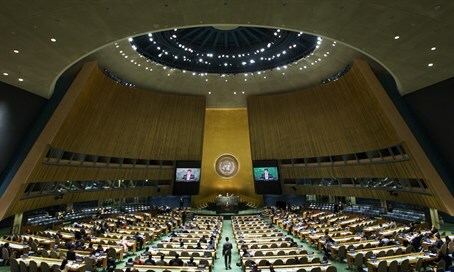 Israel should hand Golan Heights to Assad regime, and has no right to sovereignty in Jerusalem, according to General Assembly. "Surreal barely captures the scene: the world is under assault by terrorists killing in the name of Islam and martyrhood — as Palestinians did this week while stabbing Israeli Jews — and the UN’s response is to reflexively condemn Israel in six separate resolutions, all of which are one-sided," said Hillel Neuer, executive director of UN Watch, in response to the votes. Another vote - which passed 153 to 7 - claimed that Israel has "no right" to "impose" its sovereignty over "the Holy City of Jerusalem." "What is also outrageous is that these resolutions claim to care about Palestinians, yet the UN proves itself oblivious to the hundreds of Palestinians who continue to be slaughtered, maimed and expelled by Assad’s forces," he continued. Neuer accused the General Assembly of being hijacked by an "automatic majority" of fiercely anti-Israel dictatorships. "The farce at the General Assembly underscores a simple fact: the UN's automatic majority has no interest in truly helping Palestinians, nor in protecting anyone’s human rights; the goal of these ritual, one-sided condemnations remains the scapegoating of Israel," he stated. "The U.N.’s disproportionate assault against the Jewish state undermines the institutional credibility of what is supposed to be an impartial international body, and exposes the sores of politicization and selectivity that eat away at its founding mission, eroding the U.N. Charter promise of equal treatment to all nations large and small."